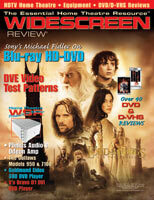 I read Widescreen Review because it’s simply the best A/V magazine available. No other magazine includes such a comprehensive discussion of developments and potential developments in the field, as well as a detailed analysis of systems and products available. Widescreen Review provides thorough and easy-to-follow “how to” sections in building and setting up home theatre and is the definitive authority on quality DVDs. No other magazine can beat all that. Kudos to Widescreen Review! I will never stop my subscription.